We and our partners at Bloggertone.com are planning another blogging contest in April. It will be called “Sugartone” (the name is a combination of BizSUGAR and BloggerTONE – get it?). And our contest partner, Bloggertone, is looking for sponsors. This is an excellent opportunity for any company that wants visibility among small business owners and entrepreneurs. With registered members of nearly 200,000, and over 50,000 active monthly visitors at the combined two sites, your brand will benefit from title sponsor visibility. The last SugarTone contest resulted in more than 1,000 branded mentions for the sponsor, across a variety of channels including Websites, blogs, Facebook, Twitter, LinkedIn and YouTube. 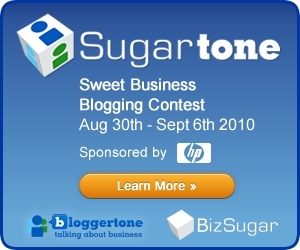 A banner ad from an earlier Sugartone contest is pictured above. The contest is elegantly simple. Individual entrepreneurs and small business professionals submit their blog posts which are then published at the Bloggertone website. BizSugar serves as the voting platform. Members of the combined communities submit, vote and/or comment on their favorite Bloggertone posts at BizSugar, during the contest. In the past there have been prizes for the top vote getting posts, as well as an Editor’s Choice pick for the post that gets the best and most thoughtful comments. Of course, it’s an honor just to be included in the contest — because bloggers also get visibility in a downloadable PDF of the collected blog posts from contest participants. Want to create brand advocates among small business leaders and entrepreneurs who are active online? This is a perfect way to increase your online visibility. As a sponsor, SugarTone offers the unique opportunity for your brand to be part of the conversation in a themed discussion. We’ll encourage blog posts and discussion around a particular topic. Topic examples: mobile marketing; software as a service; profitability in your business operations; use of social media in your business – just to name a few possible examples. Title visibility – “Sugartone Blogging Contest brought to you by YOUR BRAND” (or agreed-upon variation that prominently includes your brand name). Multiple mentions in connection with the contest, online and in the PDF ebook that will be generated at the end of the contest (see ebook here). So how can your company get involved? The sponsorship cost is $5,000 (part cash and part in-kind gifts) to help cover the contest expenses and gifts for the winning participants. Interested? Then check out more via the sponsor overview (PDF). Or contact Bloggertone at [email protected] to get involved.